According to Vatican Radio, Pope Francis made this distinction during his homily at his morning Mass at Casa Santa Marta today, as he recalled today’s first reading, which speaks of Cain and Abel. The Pontiff offered the Mass for Father Adolfo Nicolás, the former Superior General of the Society of Jesus, who is preparing to continue in his mission in Asia. “A story which begins ‘with a little jealousy,’ Francis said, explaining that Cain is irritated because his sacrifice does not please the Lord and he begins to cultivate a feeling of resentment, a feeling he could control, but does not. Cain, the Pope said, chose to harbor this sentiment and let it grow. The sin he will then commit is crouching within this sentiment. This, he continued, is how enmity between us begins with a tiny spark of jealousy or envy, and ends up growing so much that we see life only from that point of view. One gradually, the Pope warned, becomes “obsessed, persecuted” by that evil that grows and grows. “This enmity ends up destroying families, peoples, everything!” Francis said, noting this is what happened to Cain who ended up killing his brother. At the very first sign of bitterness and resentment, Francis stressed, this process must be stopped immediately. 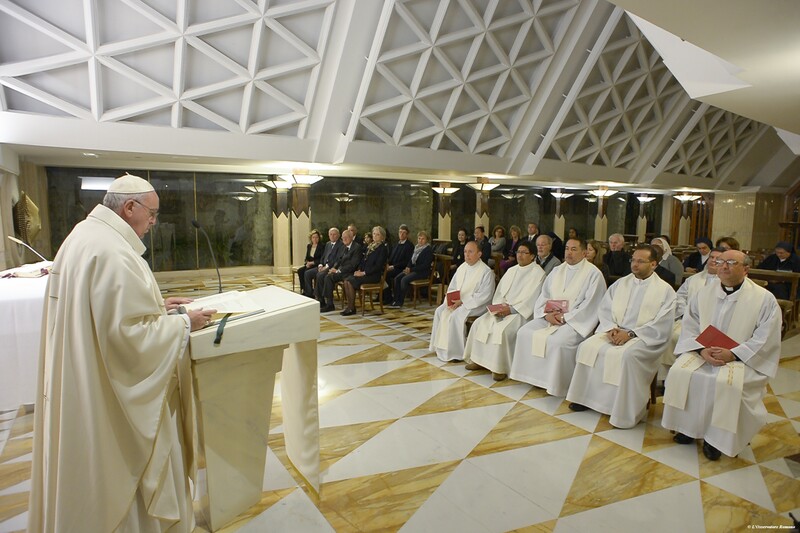 Recognizing that in his chapel this morning were some newly appointed parish priests, Francis urged them to be aware that “even within our episcopal colleagues.” there are small cracks and rifts that can lead to the destruction of brotherhood. The Holy Father then turned his thoughts to those who find themselves under the bombs of war or are driven from their homes, lamenting the process of killing starts from something small. “How many powerful people of the world can say: I’m interested in this area, I’m interested in this piece of land… if a bomb falls and kills 200 children it is not my fault, it’s the fault of the bomb. I’m just interested in the land,” he said. All of this begins, Francis reflected, with that feeling that makes you break away, not recognizing your brother, and it ends in a war that kills. Pope Francis concluded, praying that the Lord helps us repeat His words: “Where is your brother?” and makes us remember those who “we destroy with our tongues” and those treated in the world who are treated “as things” instead of brothers.